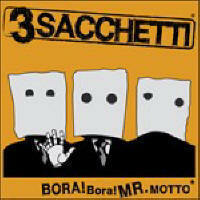 "The music of 3Sachetti is a mix of genres ranging from klezmer to jazz to rock and everything in between. It always keeps you guessing with its eclectic improvisation and wit . The trio of guitar, violin and percussion has a surprising full sound. While it can get pretty wild, the artists never seem to lose track of melody and structure." Full review on Free Albums Galore.